Got a stenciling project in your future? 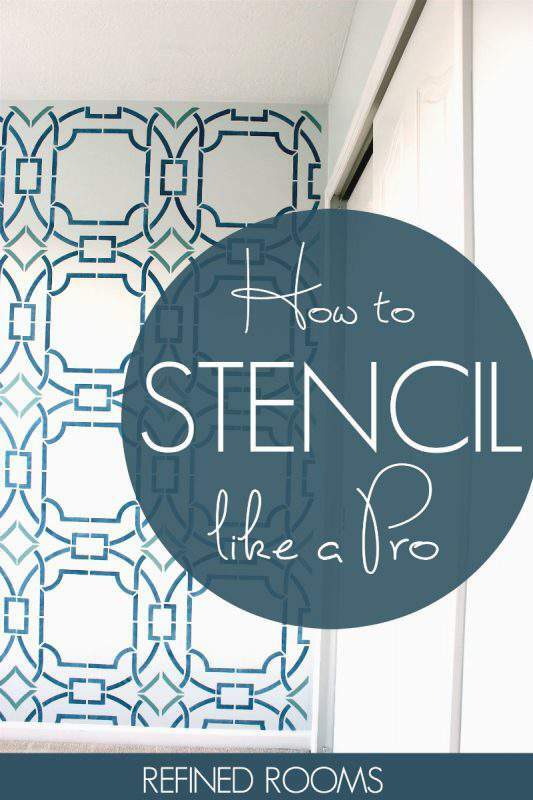 Today, I’m sharing my best wall stenciling tips and tricks to help you stencil like a Pro! A few weeks ago, I revealed our plan to transform our guest bedroom into a homework/craft room. We kicked off the transformation by removing wallpaper, in preparation for painting the room and creating a stenciled focal wall that serves to define the homework zone. Stenciling can be tricky indeed. But after conquering the focal wall in this space, as well as a HUGE stenciled wall as part of my master bedroom makeover, I’ve learned a lot of tricks to make the job easier. ROYAL DESIGN STUDIO STENCILS – I’ve become somewhat of a stencil snob over the years, since working with low-quality flimsy stencils results in a messy end-product and a lot o’ frustration. I’ve had nothing but great experiences with Royal Design Studio stencils. It’s my Go To stenciling source because their stencils are sturdy and easy-to-use. Plus their designs are stunning! For this project, I chose the Contempo Trellis design, since it’s in keeping with the modern vibe I’m trying to achieve in this space. 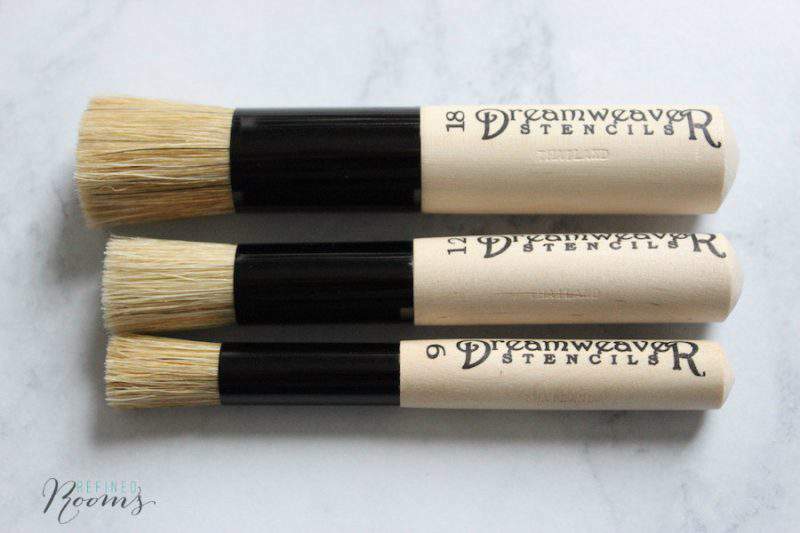 STENCIL BRUSHES – There are a variety of brush types that you can use, but I definitely prefer stiff bristled brushes over foam brushes, since I feel like they give me more control over the painting process. If you’re using more than one color in your design, you’ll need a separate brush for each color. Before you slap up your stencil and begin stippling away, determine where the best place would be to start working. In this case, I decided to work from the right side to the left side of the room so that I could avoid having to work too closely around the trim that frames out the closet door. As you’ll see in the after photos at the bottom of this post, the size of my wall dictated that there would be 5 complete circle patterns + a 1/2 circle running horizontally across the wall. 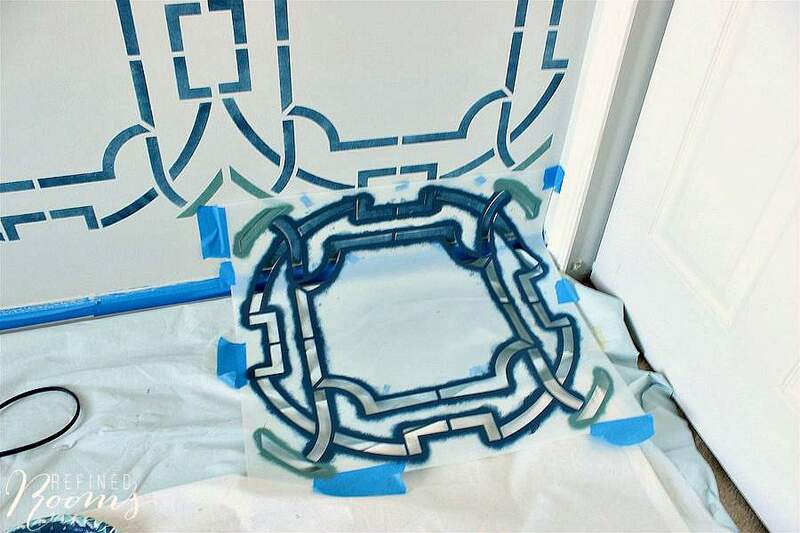 The most difficult part of the job is stenciling partial patterns, and I didn’t want to make that job even more difficult by having to work around that trim jutting out. So I made the strategic decision to begin on the right with a full circle pattern and place the partial pattern on the left side of the wall (which did not have any obstacles adjacent to it. 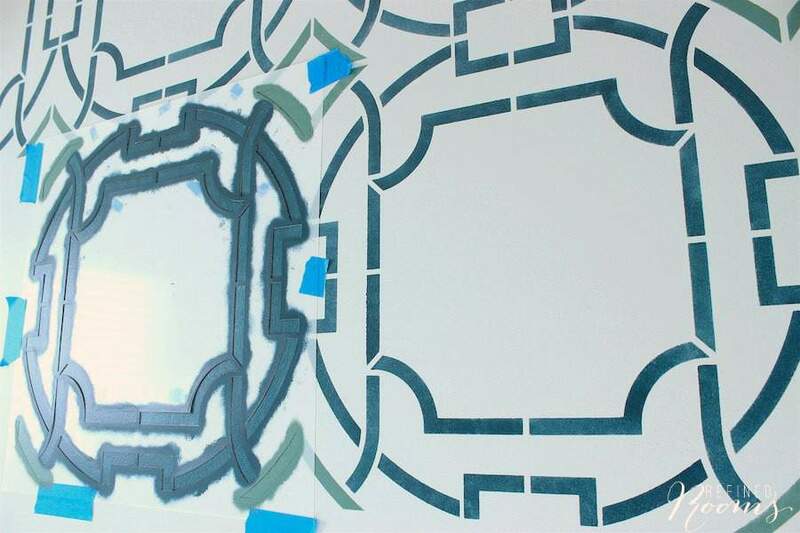 The more walls that you’ll be stenciling, the greater the probability is that your stencil alignment can get out of whack from the start point to the finish point. So when planning out your start and end points, attempt to end in an inconspicuous place, if at all possible (think behind a door, in a remote corner, or an area that is covered up by furniture, etc.). This way, any misaligned patterns will be much less noticeable. 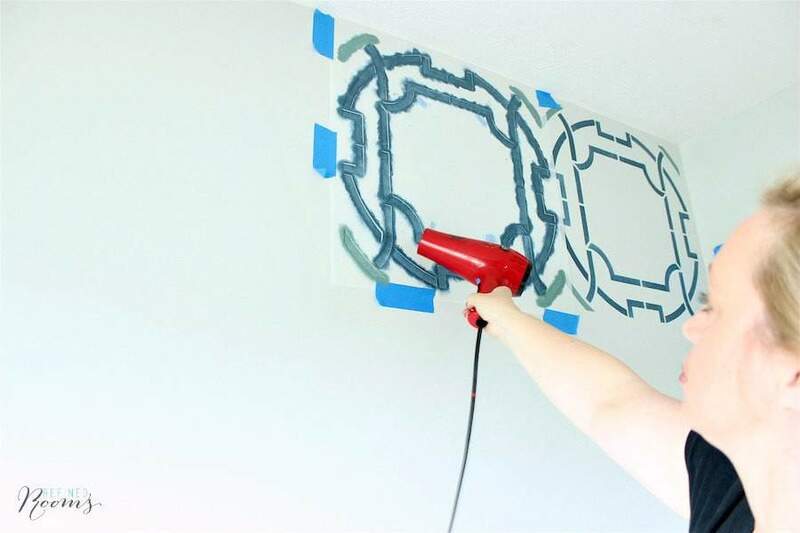 This trick was born out of necessity a few years back when I was stenciling all four walls of our small toilet closet in our master bathroom. 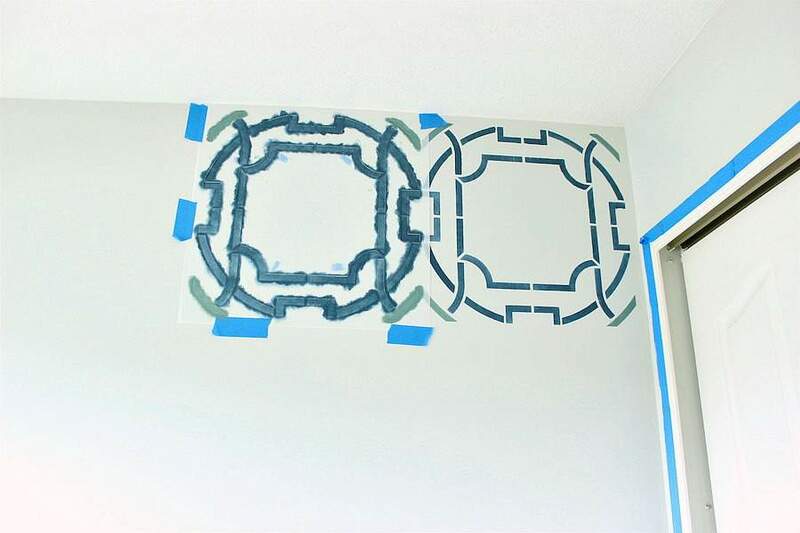 Completing a whole-room stenciling means that you’ve got to work around 4 corners with the stencil. 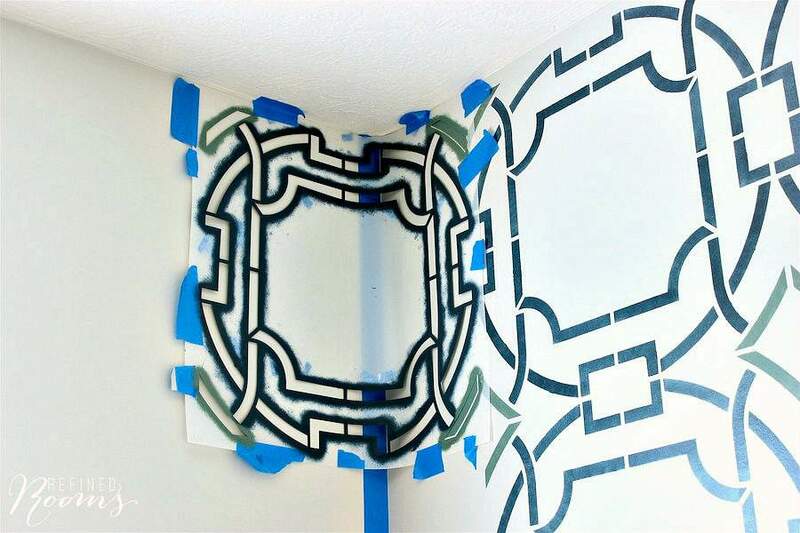 Stenciling around corners can be a royal PAIN, since it’s super difficult to get the stencil in proper position and keep it in that position long enough for the paint to dry (which often results in smeared lines). Enter your new BFF, the hairdryer. 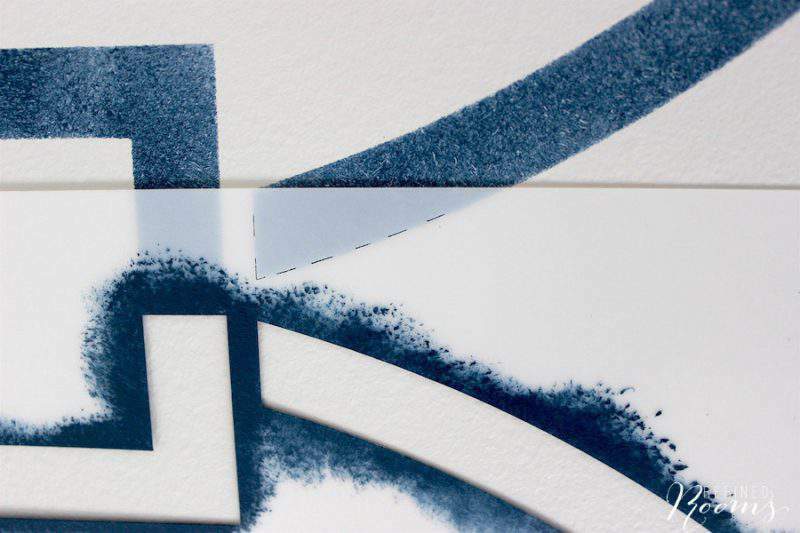 Blowing hot air onto the freshly painted portion of the stencil dramatically speeds up dry time, which translates into less smearing and paint bleeding under the stencil. It also helps you to get the job done faster. This tip probably goes without saying but painter’s tape is your best friend when it comes to minimizing touch up work. 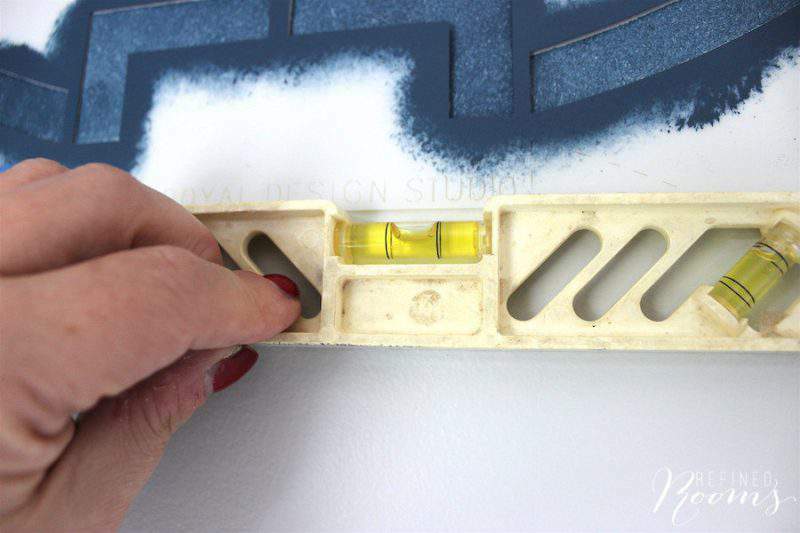 Use it to protect trim and adjacent walls prior to beginning the stenciling project. After you dip the tip of your stencil brush in the paint, tap it repeatedly on a layer of paper towels in order to offload excess paint. 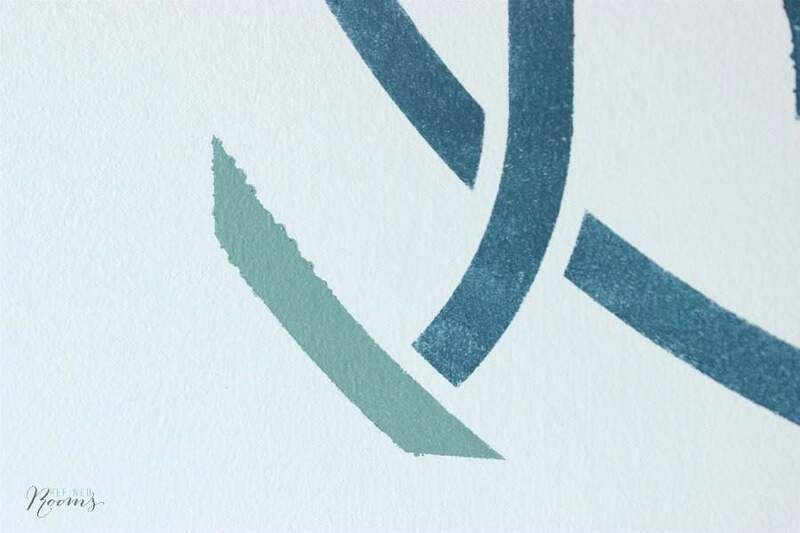 If you have paint bleeding under the stencil (like you see below on the green portion of the design), you aren’t off-loading enough paint. Let’s take a look at the finished product, shall we? 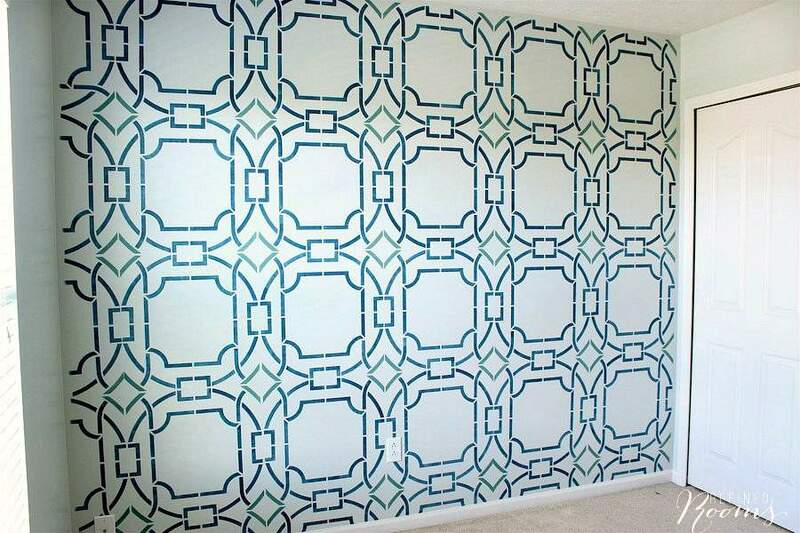 Is this stenciled focal wall a thing of beauty or what??! A huge shout out to Royal Design Studio who partnered with me on this project! 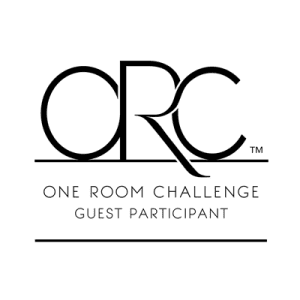 Oh, and don’t forget to check out all the rooms that are being transformed this season’s One Room Challenge over at Calling It Home! What going to wallpaper new house feature walls …but you have inspired me! Thank you. Oh my yes. 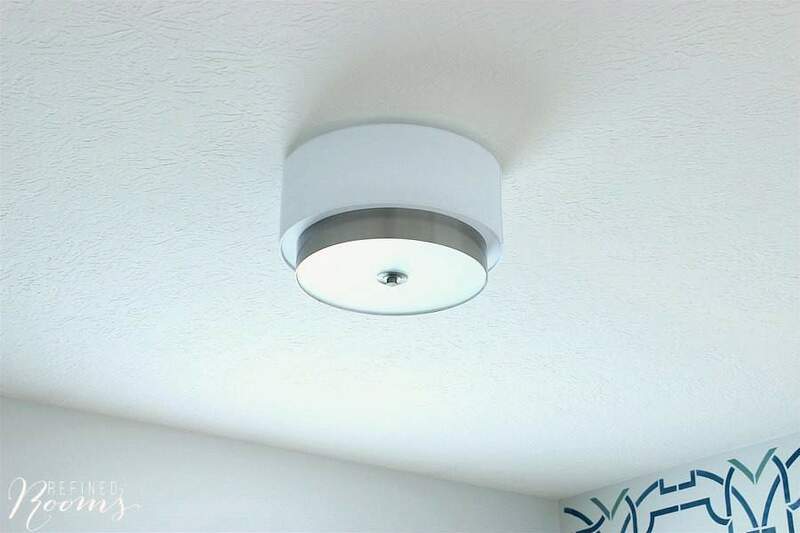 So much less expensive, and so much easier to redecorate when you no longer love it! I love the color scheme. 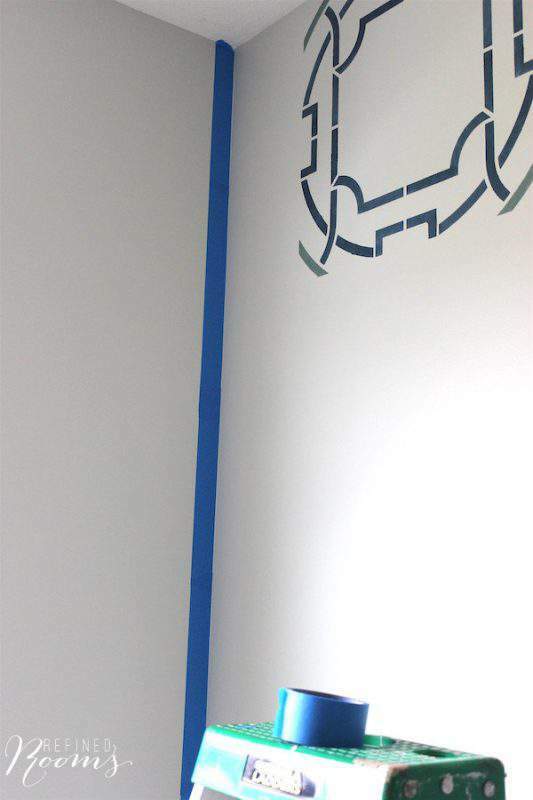 Can you share which colors you used for the stencils? That pattern is so dramatic and beautiful on the wall in those colors!! And yeah, our living room also has a blob of blue paint on beige carpeting, also covered with an area rug!! LOL! I’ve heard from many people who’ve made this same mistake…glad to know I’m not alone! I am still amazed by the mad skills people have on stenciling … such precision and patience to do a perfect job! 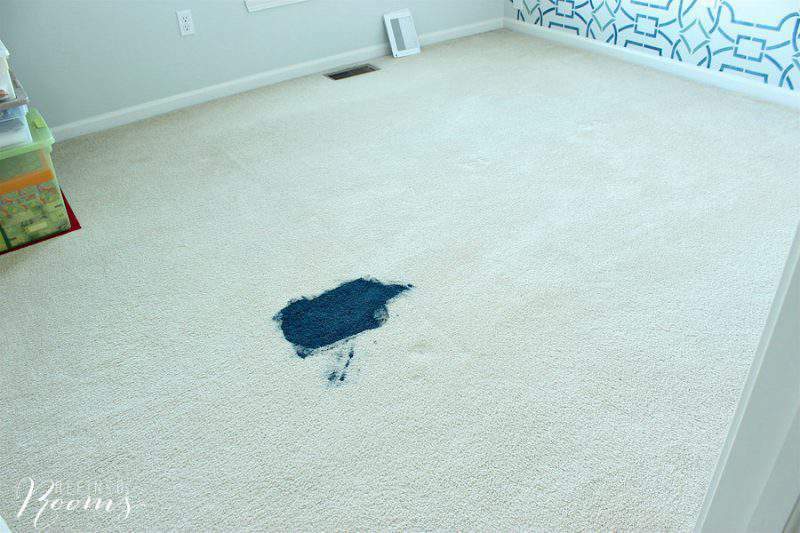 Sorry about the carpet but on the up side, you have a reason to buy a new area rug! Looking forward to week 4! It does require patience, but the end result is so so worth it! Thanks for stopping by Tim! 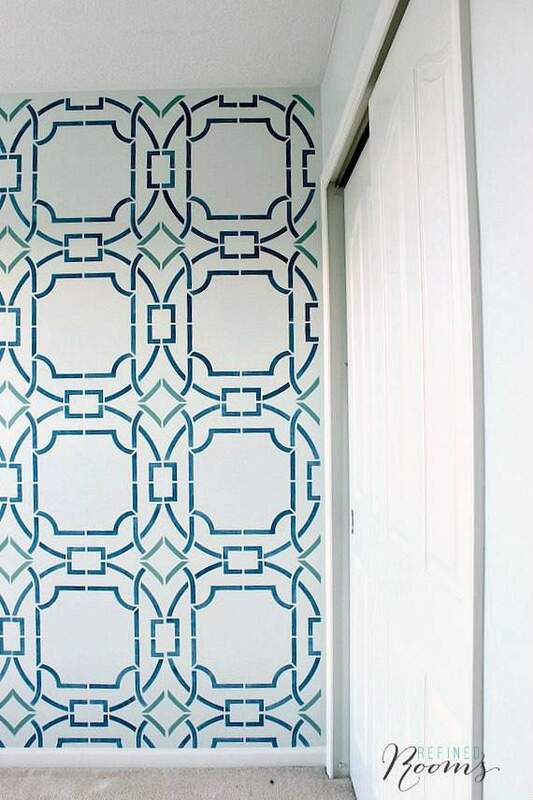 Absolutely stunning – I love the idea of a stenciled feature wall and the colors are amazing! Thanks so much Kristen! Definitely a labor of love…but I do LOVE it!